Good things come in small packages--and when it comes to storage, the saying couldn't be more true. No matter what size your data set is, you can find a stylish, pocketable wonder of modern miniaturization to store it and transport it. 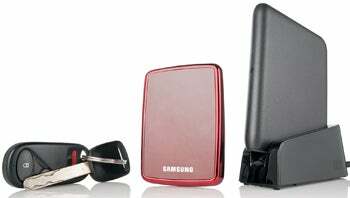 Tiny Size: Car keys (left) aren't out of scale with Samsung's 120GB S1 Mini and WD's 500GB Elite drive. All portable storage units do basically the same thing, but these days they come in more flavors than you'll find at Baskin-Robbins. PCWorld Labs tested 22 models, from the credit-card-size Samsung 120GB S1 Mini to the latest capacious yet svelte 1TB Seagate FreeAgent Go and Western Digital My Passport Essential SE 1TB drives. We tested dockable models, ruggedized units, and multiple-interface units that can connect to almost any PC. Many of them came with surprisingly capable customized software packages that pop up the minute you attach the drive. There's something for everyone; and some of the test results we obtained will surprise--if not delight--PC fans. For a ranked chart of the most outstanding models we examined, see "Top 10 Portable Hard Drives"; for a list of all 22 models we tested, together with bottom-line assessments, see "Lab-Tested: Portable External Hard Drives." Interfaces: Iomega's eGo (left) and Rocstor's Rocport ID9 (right) use USB, FireWire 400, and FireWire 800. WiebeTech has eSATA, USB, and FireWire 800. Our lineup of drives includes models from Adata, Buffalo Technology, CMS, Hitachi, HP, Iomega, LaCie, Rocstor, Samsung, Seagate, Toshiba, Verbatim, Western Digital, and WiebeTech. Of the 22 drives we tested, 17 exclusively use the USB 2.0 interface. Most of those 17 have a mini-USB port, but the Western Digital models use micro-USB connectors (most often found on cell phones). Five drives have FireWire 800 or 800/400 interfaces as well as USB 2.0, and the WiebeTech ToughTech XE Mini has an eSATA port, too. Though it offers tremendous speed, eSATA remains rare on portable drives. The Airhawk, Rocport, and SureFire models are termed triple-interface drives while the Wiebe­Tech is called a quad-interface drive. Models with extra interfaces tend to cost a bit more, but dual-interface USB/FireWire 400, triple-interface USB/FireWire 400/FireWire 800, and quad-interface USB/FireWire 400/FireWire 800/eSATA drives behave better under many circumstances and deliver superior performance when connected via something other than USB. Depending on the test, the eSATA-based Wiebe­Tech ToughTech XE Mini and the FireWire 800-linked Rocstor Rocbit FX KT, Rocstor Airhawk A9, Rocstor Rocport ID9, and Io­­mega eGo ran approximately two to three times as fast as the USB 2.0 drives. Though eSATA is the fastest interface, two drawbacks inhibit its practical value in portable drives. First, the eSATA connector was not designed to carry power, so you must use an AC adapter to power a drive us­­ing the eSATA interface. Second, eSATA drives aren't reliably hot-pluggable; in order for the drive to show up under Windows Explorer as a drive letter, you must plug the drive in before you boot or you must reboot after attaching it. FireWire 400 and 800 behave the same way USB 2.0 does, except that they're better. Seconds after you plug a unit in, the drive letter appears; and unlike with USB 2.0, underpowered ports are rare. Unfortunately, FireWire 800 ports are hard to find except on Macs. Adding one to a Windows PC costs $30 or so for an add-in card and even more for a notebook adapter card. FireWire 800 is backward-compatible with FireWire 400 (with an adapter cable); and thanks to cameras and DVRs, those ports are relatively common. The FireWire drives we tested included a FireWire 400 port or an 800-to-400 adapter cable, so you can probably patch together a FireWire 400 setup without an additional cash outlay. Power is an important issue with portable drives: eSATA requires a separate AC adapter, and many USB ports on netbooks, laptops, and even PCs are underpowered. No one wants to carry an AC adapter around with them. Of the 22 models we reviewed, 21 relied for power on a single USB 2.0 port on a desktop PC. 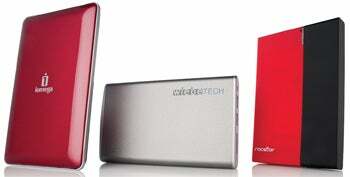 The sole exception was the WiebeTech ToughTech XE Mini, with its unpowered combination USB 2.0/eSATA port. But even the Wiebe­Tech didn't need an AC adapter when attached via FireWire 400 or 800. One way to deal with underpowered USB ports is to use a two-to-one USB cable that draws power from two separate USB ports. Iomega's eGo drive, all three Rocstor units, and Seagate's FreeAgent Go docking station shipped with these hedge-your-bet accessories. Yet another USB drawback that you might run into: USB 2.0 drives attached to PCs sometimes prevent them from clearing POST (power-on self-test) and booting. I've never been able to trace the cause of this phenomenon, but I've experienced it on a number of different PCs.